The Sacred Page: What do Bible scholars really do? 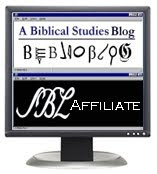 What do Bible scholars really do? Some readers of this blog are bible scholars themselves, so they don't ponder the headline question of this post. Others might. I mean, beside teaching and speaking at conferences, what do bible scholars do with all their time? What are the secret "scholarly" things they do that make them "scholars"? Unfortunately, the answer is not always too exciting. The technical projects on which we often work, intended for other scholars, are frequently esoteric. It can take a while to explain why they are interesting at all. Case in point: at the upcoming Society of Biblical Literature conference (the big professional meeting for North American bible scholars) in New Orleans, I'll be giving a paper discussing whether the ancient author of Leviticus 25 was copying from Deuteronomy 15 when he wrote. Why is this interesting at all? It has to do with how the Pentateuch was written, and how the laws of the Bible developed. I did my dissertation on Leviticus 25, and have spent a lot of time pouring over both that passage and also Deuteronomy 15, which has a different laws about some of the same topics. So I'm going to argue there is no "literary dependence" between these passages. But I could be wrong. If any of our good readers can find a convincing example of copying between Lev 25 and Deut 15, let me know! "What are the secret 'scholarly' things they do that make them 'scholars'?" You mean besides the secret handshake and the decoder rings? 58. It only remains for us, Venerable Brethren, to refer to those "sweet fruits" which Jerome gathered from "the bitter seed" of literature. For we confidently hope that his example will fire both clergy and laity with enthusiasm for the study of the Bible. It will be better, however, for you to gather from the lips of the saintly hermit rather than from our words what real spiritual delight he found in the Bible and its study. Notice, then, in what strain he writes to Paulinus, "my companion, friend, and fellow mystic": "I beseech you to live amidst these things [the Bible and Biblical study]. To meditate on them, to know nought else, to have no other interests, this is really a foretaste of the joys of heaven." That's right, Jim. You caught on to my little ploy. Actually, B. Levinson and J. Stackert have already made the case for literary dependency as best it can be made, and now I need to respond. I think Bible scholars have too much time on their hands. I would mandate that all Bible and Theology Scholars get a regular job and do their scholarly pursuits with the remaining time. With so much time they come up with things like the gospel of Q, the J and P sources, and in time like the Johny Cash song says, "it turns out there there ain't no Jesse James" no real miracles, no Exodus, no parting of the Red Sea, no Virgin Birth, no resurrection, etc., and start thinking that they know more about the bible than the Church or even the original writers themselves or God! Proud of My Alma Mater's Huge Purchase! So Ancient Jerusalem Really Was Important!? Reading Too Much Into Jesus' Miracles?